The lineups have been revealed the lineups for the Denver and Chicago Riot Fests. You can check those out below. Misfits (with Danzig, Doyle, & Jerry Only), Ween, Death Cab For Cutie, Jane’s Addiction, (performing “Ritual de lo Habitual“), Sleater-Kinney, Nas, Deftones, Fitz & The Tantrums, Descendents, NOFX, Underoath, Bad Religion, Thursday, Tyler The Creator, Pepper, Jake Bugg, Motion City Soundtrack, Wolf Parade, The Hold Steady, (performing “Boys And Girls In America“), Yo La Tengo, Sleigh Bells, Chevy Metal, The Dandy Warhols, Vince Staples, Suicidal Tendencies, Flatbush Zombies, Hatebreed, Lagwagon, The Aquatbats, Glassjaw, The Wonder Years, Me First & The Gimme Gimmes, Danny Brown, Against Me!, Meat Puppets, Leftover Crack, Dan Deacon, Murder By Death, Rogue Wave, Converge, Billy Talent, Fucked Up, Lewis Del Mar, Set Your Goals, Juliette Lewis & The Licks, Touche Amore, Frnkiero Andthe Cellabration, Pouya, White Lung, Plague Vendor, People Under The Stairs, Fat Nick And Don Krez, Violent Soho, Judith Hill, Tigers Jaw, Bleached, Diarrhea Planet, Planes Mistaken For Stars, Dee-1, Kirk Knight, Somos, Turnover, Jessica Hernandez & The Deltas, Bryce Vine, 3TEETH, Night Riots, TBA, Syd Arthur, Holy White Hounds, Jule Vera, Microwave, Death Spells, Diet Cig, Donna Missal, High Wasted, and Culture Abuse. Misfits (with Danzig, Doyle, & Jerry Only), Morrissey, Ween, Death Cab For Cutie, Rob Zombie, (performing White Zombie‘s “Astro-Creep 2000“), Social Distortion, (performing “White Light, White Heat, White Trash“), Brand New, Nas, The Specials, Deftones, Fitz & The Tantrums, Jimmy Eat World, Descendents, Refused, NOFX, Bad Religion, Pierce The Veil, All Time Low, Underoath, Motion City Soundtrack, (final show), Thursday, Jake Bugg, The Hives, Death Grips, Chevy Metal, Bob Mould, The Hold Steady, (performing “Boys And Girls In America“), Glassjaw, Me First & The Gimme Gimmes, Pepper, Tiger Army, Meat Puppets, GZA, The Wonder Years, Method Man & Redman, Dan Deacon, Dee Snider, Andrew W.K., Gwar, Leftover Crack, Billy Talent, The Anniversary, Neck Deep, Highly Suspect, Smoking Popes, Fucked Up, The Vandals, The Dillinger Escape Plan, Girls Against Boys, Fu Manchu, The Falcon, I The Mighty, The Toasters, Set Your Goals, Juliette Lewis & The Licks, Frnkiero Andthe Cellabration, Tigers Jaw, Basement, Citizen, Swingin’ Utters, Big D & The Kids Table, Diarrhea Planet, Pouya, Touche Amore, Hippo Campus, Balance & Composure, People Under The Stairs, White Lung, Denzel Curry, Jessica Hernandez & The Deltas, Turnover, Violent Soho, Dee-1, Bleached, Brick + Mortar, Night Riots, Plague Vendor, Off With Their Heads, Holy White Hounds, Laura Stevenson, Somos, Tancred, Microwave, Deal’s Gone Bad, Death Spells, 3TEETH, Black Foxxes, The Wans, Creeper, The Walters, Julie Vera, Marina City, Worriers, Nots, Big Ups, All Dogs, The Dirty Nil, Eskimeaux, War On Women, Hard Girls, A Will Away, Can’t Swim, With Our Arms To The Sun, Donna Missal, Bad Cop / Bad Cop, Tasha The Amazon, Blackbox, High Wasted, Partner, Sleepy Kitty, and School Of Rock. The ‘Hellzapoppin Circus Sideshow Revue‘ will also be on hand for both festivals, and more bands are still to be announced. 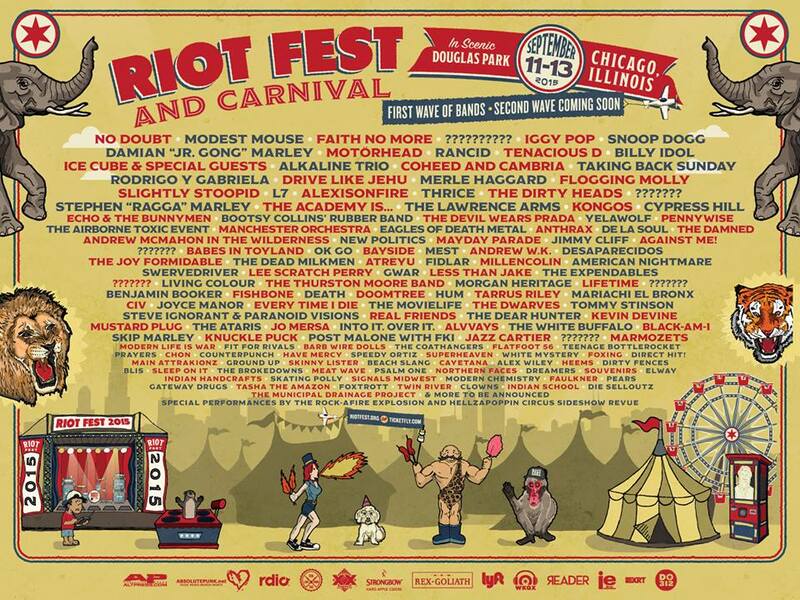 More acts have been added to the various Riot Fests. Bands added to the Denver Riot Fest include: System Of A Down, The Prodigy, Death Grips, 88 Fingers Louie, Chef’Special, and Input + Broken. Bands added to the Chicago Riot Fest include: System Of A Down, The Prodigy, Death Grips, 88 Fingers Louie, and Chef’Special. 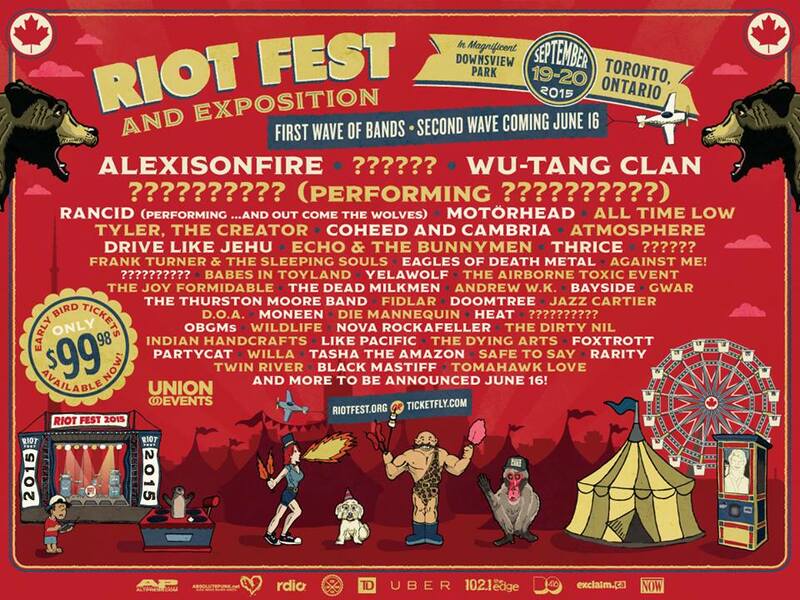 Bands added to the Toronto Riot Fest include: Weezer (performing “Pinkerton” and ‘The Blue Album’), The Prodigy, Bleachers, Cancer Bats, Courage My Love and Ritual. 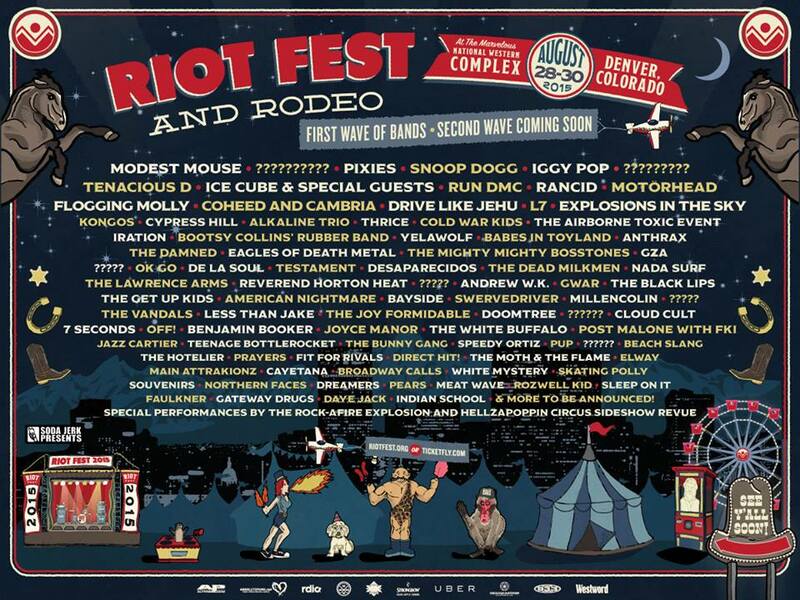 The initial lineup has been revealed for this year’s Denver Riot Fest. The festival will take place August 28-30, at the National Western Complex, in Denver, CO, and will include: Anthrax, Motörhead, Testament, GWAR, Thrice, Rancid, Andrew W.K., OFF!, and much more.